Sometimes the stars line up and you get an absolute cracker. 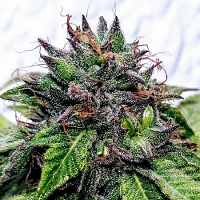 Sticky Zkittlez Glue Feminized Cannabis Seeds by Cream of the Crop Seeds: Sometimes the stars line up and you get an absolute cracker. Team Cream crossed the now world famous Gorilla Glue #4 with the super tasty strain Zkittlez and ended up with Sticky Zkittlez Glue. An Indica dominant, crystal coated, juicy, nugg laden beauty. Her superabundant pistils shining bright with gold and reddish brown colours dazzling you into her sticky world. 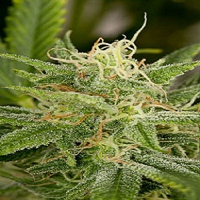 With her physical & cerebral high, she is great for leaving the stress of the day behind. She tends to get very sticky given the high resin content of the GG#4 used in the crossing so we expect her to become a solid favourite for all lovers of extract. She will grow well in most climates, treat her with love and care - you will be rewarded greatly.